Paige is now attending multiple classes and is even in the dance company. There are many studios in the area but this one is a true gem. Thanks Ms. Mea and staff. My grand daughter has been attending classes here for 4 years now...since she was 3. The staff is amazing and they really teach dance not just the dance for the recital. That means a lot. Paige is now in the DXC Minis. She is loving it even more. Thanks Mea and Company. My daughters love dancing at Dance Xperience! Everyone is so friendly and treated like family. My girls have learned and grown in the years they have been going here, my oldest is on her 6th year and youngest on her 4th. We look forward to the recital every year, and each year the show amazes us. 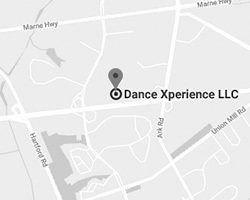 Recommend Dance Xperience to anyone looking for a dance studio! My daughters have been dancing at Dance Xperience for 5 and 4 years. When my oldest daughter tried a summer class there, she told me she wanted to switch her dance studio to Dance Xperience because she feels special there. She was going into 5 th grade at the time. Since then, both my daughters attend and are on the dance company. Their dance technique is amazing, they truly love their teachers and have made their closest friends there. It is their happy place and home away from home. We are truly grateful for their dance family. What wonderful experiences my daughter has had! The teachers are amazing! She has learned and improved so much in a year’s time due to the level of dance that is taught at Dance Xperience. The other dancers and their families are very welcoming and down to earth creating a caring, family environment. My daughter started with a few classes in the summer to “try it out”. In a few weeks time, she asked to join the Dance Company and was welcomed with open arms. The teachers are positive role models and exhibit and teach confidence and positive self-esteem. We couldn’t be happier with our choice to come to Dance Xperience. I could not have picked a better studio for my daughter to learn and grow in dance. The entire studio is STUDENT centered. The receptionist cares for the children like they are all her own. The teachers are passionate, encouraging, and challenging to the students. Their entire focus is students. My daughter has grown tremendously in all of her areas of dance due solely to her wonderful teachers. The recital is about the students...ALL about them. I have never been so pleased in what I have found for my daughter at Dance Xperience. Angelina loves dancing and you should see her teaching my mom and I her dance moves in order for us to practice with her. She's also trying to choreographer a dance for us at my wedding! I really owe you and all the wonderful teachers at Dance Xperience. You have brought forth this passion in her and have taught her so many wonderful things. I appreciate it so much. I just wanted to shoot you a quick email to let you know how impressed I am on this year’s recital. You never cease to amaze me with your creativity! I feel like every year I think you can’t top the last, but you find a way to!! The production is phenomenal. It’s so funny, and witty!! !